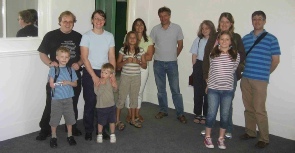 Heritage Open Day - Bigger and Better than Ever! And this group had just finished their tour - still looking happy! That's good. We had a record turn out this year with over 1,000 visitors evenly split over the two days. At one point we had four tours running at the same time. One reason, (other than the Spike being such a fascinating building), for the huge turn out was the regular stops made by the Shuttle Bus. It would often disgorge 20 or more visitors at a time. A great success and thank you to Guildford Borough Council for allowing the detour. Now, if only it could remain on divert throughout the year. A big thank you to Phil Evans and his team of YMCA volunteers who came to make a start on the secluded garden. All went well in the morning and the team made a good start getting rid of some very polluted soil. New topsoil was then mixed in with compost and the bed was finished with genuine Victorian rope twist clay edging tiles. And then it rained and rained, but the volunteers pressed on until the job was done leaving a very happy flower bed ready for planting! 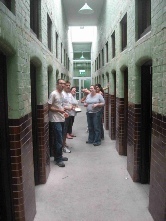 Guildford Solicitors Charles Russell LLP came along to help with painting some of the heritage cells and, it would appear, also themselves. A really lovely crowd - thanks for your help! 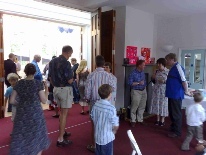 One of the little known businesses of Guildford are its language courses and Guildford English, one of the longest established of the Guildford based courses, entertained their students and host families to a barbeque prior to the prize giving and thank you ceremony. The Spike coped very well with approximately 140 guests! The first party to be held at the Spike was for Josh Goodwin's big one. 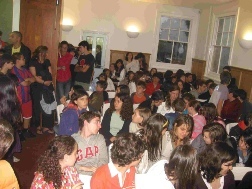 In all around 60-70 guest of all ages attended. Weather was reasonable, only light rain, but that didn't stop the children having a good time in the Spike playground. The first Board Meeting at the Spike of the directors of the Charlotteville Jubilee Trust. 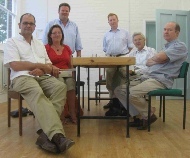 John Redpath, Gina Redpath, Charles Turton, Josh Goodwin, Graham Long and Philip Benson. We followed the Dorking to Guildford route once again. With the glorious weather the event was another great success. 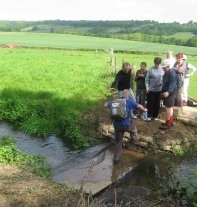 More interesting for being a bit of an obstacle course especially at this river crossing just outside Dorking. This year Sharon Ward was raising money for the Spike Project with matched sponsorship from Barclays Bank. This weekend saw a lot of hard work from Naturalight's riggers. The lanterns arrived on the stormiest day in 17 years and by the weekend, when this shot was taken, temperatures were heading for sub zero, and it's cold on that roof. Thanks lads for keeping us on schedule!